If you are thinking of buying a new bicycle, consider the newest option available in the market: bamboo cycles. The bamboo bicycle's frame and handlebars are literally made with actual bamboo. The geniuses behind this new gadget are Abu and Jake from Chengdu. According to Sina, It all started when Abu quit his job as a product design engineer to open his own travel agency in 2011, out of his love for traveling. In running his travel agency, Abu came to meet many foreigners who loved to travel on DIY bikes. Such encounters inspired Abu to build a bicycle with bamboo. He then teamed up with Jake, a bicycle afficionado who was already running a bike shop. 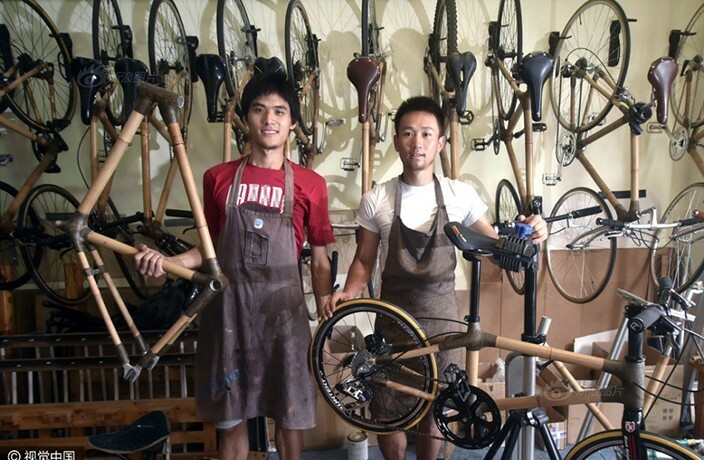 Abu revealed that the first step in building a bamboo bike was to choose the right kind of bamboo. After trying out tens of different types of bamboo, Abu learned that Tonkin Cane bamboo from Guangdong — three to five years of age — was the most suitable kind. The bamboo was then cut into pieces of the right sizes to be used for different purposes. The next step was to prepare the bamboo pieces so that they don't fall victim to cracks, mold and bugs. Abu decided to bake the bamboo pieces at about 100-150 degrees Celcius, which also helps in cleaning them. Then, the bamboo was coated with a layer of oil. After this process, the bamboo became as sturdy as a steel pipe, enough to withstand the weight of an adult. Abu then tested the quality of his bamboo bicycle. In March of this year, he sent a bamboo bike to Europe to have it tested, and was notified that his bike met European standards for bicycles. Then, he embarked on a journey to ride his bamboo bike from Chengdu all the way to Lhasa, Tibet. He left Chengdu on May 3, biked 2,500km over a period of 30 days, and safely reached Lhasa. Here is Abu, on his bamboo bike, receiving a curious peek from an ayi. So it looks like we have a unique new option available in a country known for its bike culture and bamboo. If this isn't hipster, we don't know what is. Over 500,000 Chinese netizens are discussing the tragic fire on Weibo. No Billy, there's no soda in that vending machine. One of China’s largest providers of stock images, Visual China Group (VCG), closed its website and apologized last Friday. Currently, all of the planets in the Solar System, with the exception of Earth, are named after Greek and Roman gods.